VERY FINE. 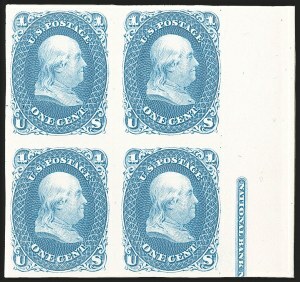 A BEAUTIFUL AND EXTREMELY RARE COMPLETE SET OF 1861 FIRST DESIGNS AND COLORS PLATE PROOFS ON INDIA, IN BLOCKS OF FOUR. NO MORE THAN TWO CAN EXIST. According to essay-proof specialist James Lee, only two complete sets of these India paper proofs are possible. 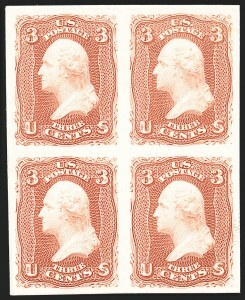 The set possibilities are limited by the extreme rarity of the 1c, 24c, 30c and 90c values in blocks of four. VERY FINE. 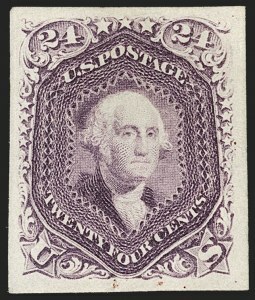 THIS IS THE ONLY RECORDED PLATE BLOCK OF THE ONE-CENT 1861 FIRST DESIGN PLATE ESSAY ON INDIA. To the best of our knowledge, there is only one other example of the 1c First Design with the plate number, a bottom strip of four in Ultramarine shade. VERY FINE. 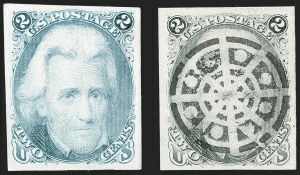 A CHOICE COMPLETE SET OF THE 1861 ISSUE PLATE PROOFS ON INDIA IN BLOCKS OF FOUR, INCLUDING ALL THREE OF THE 3-CENT COLORS. VERY FINE-EXTREMELY FINE. 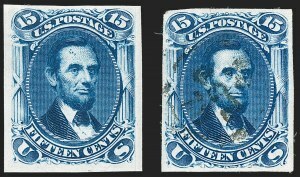 A VERY DIFFICULT TO DUPLICATE COMPLETE SET OF 1861 ISSUE CARD PROOFS FROM EACH OF THE FIVE DIFFERENT PRINTINGS. VERY FINE. 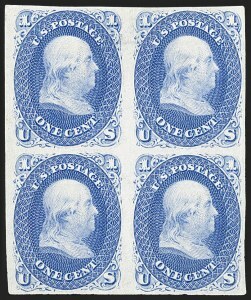 A SCARCE COMPLETE SET OF BLOCKS OF FOUR OF THE 1861-66 ISSUE PLATE PROOFS ON CARD. VERY FINE-EXTREMELY FINE. A MAGNIFICENT COMPLETE SET OF ATLANTA TRIAL COLOR PROOFS FOR THE 1861-66 ISSUE DESIGNS. THIS IS ONLY THE THIRD COMPLETE SET OF ALL 50 PROOFS WE HAVE OFFERED IN DECADES. The Atlanta trial color plate proofs on card were prepared for display at the 1881 International Cotton Exposition in Atlanta. Only one sheet of 50 in each color was printed. 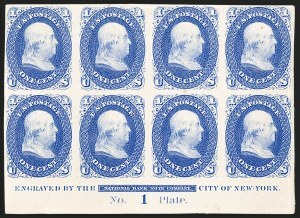 The sheets were somehow acquired by James A. Petrie of Phillipsburg, New Jersey, at the close of the exposition (along with the 1869 invert card proof sheets). Petrie claimed that he rescued the proofs just before they were to be burned. They were cut up into one set of blocks of eight, two sets of blocks of four, pairs and singles. These are often offered either by denomination or in other smaller groupings. It is difficult to assemble the complete set.